The download is in and it includes gnomes, armadillos, puppies, kittens and... boxes. Who said games characters can't have personality any more? Box Pusher (GameOn, 500pts) — You're the box pusher. Pushing boxes is what you do, and you do it well. In fact, you're the greatest box pusher this town's ever seen. Make and share your own levels in this puzzle game, which we'll review soon. 2 Fast 4 Gnomz (Qubic Games, 500pts) — From the creators of Gnomz comes the sequel, though this is more a platformer than a scrapper. Full review coming up soon. Dillon's Rolling Western (Nintendo, $9.99) — OK, so Dillon's Rolling Western was released yesterday, but you might have missed it. We'll have a full review for you soon. Nintendogs + Cats (Nintendo) — Like Europe, you can have a free trial of Nintendo's feline-canine combo, then read through our Nintendogs + Cats review for more. I am surprised how far behind America is falling in terms of VC releases this time. No 3DS VC but at least a demo. @Bass_X0 By what, just two weeks? People will never be happy. Honestly, I'm tired of all of these great downloadables coming out one after another. I still need to finish games like Rayman Origins, Skyward Sword, and Skyrim, so this is a nice breather. ...Meh. Not interested in any of this. Already have Nintendogs + Cats and have played it to death. People should be happy about this weeks download. It's not like, after all these years, people should expect any better from Nintendo. bad week? get rolling western! A few people have complained about the price of Rolling Western but really it's the same price as a 1000 point WiiWare game, and there are loads of them. Did you guys get the game early like a lot of other websites? Pfft. Bad week? I agree with Luigifan above- I have way too many games to play already. Rolling Western seems pretty cool...I just don't know about putting ten bucks into it since there is so many games coming on soon that are going to cost a good bit....downloadable games for me would include Wario land and Sonic Triple Trouble, and then, there is Mario Party 9, Kid Icarus Uprising, , and then Mario Tennis! And that's just through May! I might even be missing something. Out of the three critic's reviews there have been so far for Dilon's rolling western, IGN's is the only positive one and I'm not surprised. Meh. I'll download the demo for sure but seeing how I still haven't gotten around to playing the M&S demo this is yet another space filler. Might get Dillons.... but not sure. I think Dillon's is great. Fun gameplay, great strategy involved in building up your defense towers, decent graphics, good atmosphere. It has a good amount of replay value and exploration, as you have pretty strict time limits for getting good ratings on the stages but can replay them once you have better gear and more money. I dig it, and I can see spending 15 hours or so on it so $10 really isn't worth complaining about. Technically this update has nothing, since Dillon was yesterday and separate. But I'll try and be happy with that, which I'll look at getting once reviews start circulating. I mean another week without La-mulana, Descent, and Retro City Rampage is a bad week. We have had about 75 of these disappointing weeks so far, the Wii may be dead before they come out. Not that there haven't been a few good games in the meantime but just compare a week of downloadable releases on Nintendo systems against ipad or xbox 360 (which I don't even own) and you can see just how bad things are in our Nintendo world. Terrible week. Maybe next week we'll get an interesting demo. I've been thinking about buying Nintendogs+Cats recently. No idea there was a demo coming out. So it's really a mixed bag so far. IMO, I really enjoy this game and I think it's really great, but I also agree with a lot of the criticisms. There are games that I want to play that remain unreleased... and I have to admit that WarioLand (3DS VC) is at the top of the list. But what does it matter if the game comes this week or next? I've got a ton of great games to enjoy right now - more games than I have time for - and would LOVE to spend more time with Resident Evil, Zen Pinball, and Xenoblade anyway. Also, am I the only dweeb who is actually really excited about a Nintendogs demo? I've never tried the game, but think it looks vaguely interesting. My young daughter will also be thrilled when she finds a doggy to play with on the 3DS. I'll end up getting Rolling Western, despite my initial surprise by it's price. Looking forward to some 3DS VC, but I'm not going to get upset by the infrequent updates, I still have lots of great games to play! Box Pusher sounds like a know-off of Pushmo. I've been playing Rolling Western, and it's pretty darn bad. WAY too repetitive, too little tower defense mechanics, and near-broken controls. SKIP. Rolling Western looks somewhat interesting but the price is a bit too steep for something I'm not sure of. I have to get through MGS Snake Eater 3D anyway. When will we get Oracle of Ages? I thought for sure Wario Land was going to be released this week, really hope it comes soon. Virtual Console games take a back seat when a 3DSWare game gets released that week. VC games almost always get released when there is no 3DSWare game. There's probably one or two exceptions though. @Weird_Fox Considering Nintendo hasn't said anything about it coming to 3DS VC, possibly... never. Rolling Western more than makes up for no VC releases. This is not a bad week. Nothing for me really this week but after all the stuff I downloaded next week I am not too upset. Rolling Western is awesome. I just love the way Dillon opens chests, Zelda FTW. Hopefully we will be back to an every other week Wii VC release schedule and we will get something next week. ooh, this looks fun. Never played any of the pet games before. It's got to be better than that metal gear thing, that was horrible. Can't believe how bad that was, everyone always says how great the metal gear stuff is and that thing was so bad (graphics, controls, story, boring). I had higher hopes for it, but the dogs/cats things looks fun for a bus ride or something. Nothing for me this week. Too bad Rolling Western is too mediocre to justify the high price, IMO. No VC either! I was hoping for Wario Land or Block Ball. Oh well, I just got MGS3D yesterday, and I know I have quite awhile to go in that. Just beat Ocelot last night (first boss). Gonna get the Demo. Haven't played that one yet. Still no Crush 3D demo but we get Nintendogs instead? Sigh. 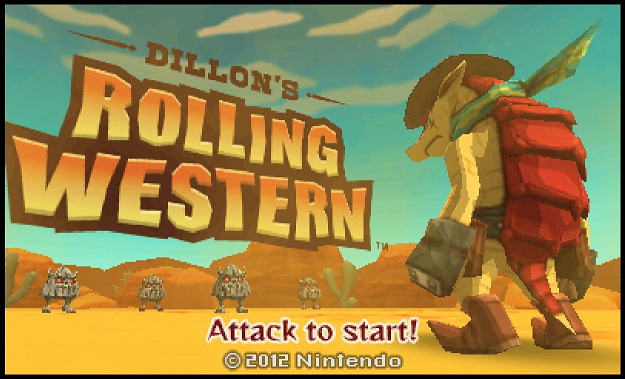 I guess Dillon's Rolling Western would have been in today's update but Nintendo decided to release it a day early due to yesterday's event. So, not much at all this week. Oh well, I got my hands full with Metal Gear 3D right now. Better luck next week. Hmm. For some reason, the Nintendogs + Cats Demo only permits up to 10 plays. ...Ok I'll just say it. Maybe everything. Definitely the nintendogs demo though. Nintendogs... ? :/ It's amazing how so far they haven't release a single demo I care to try. So far Rolling Western's been real good. I think the real sticking point for everyone's going to be the controls. I love 'em, it gives a satisfying tactile edge to combat, but then again I loved Metroid Prime Hunters' controls as well. I would have preferred more control over your towers (where they aim, etc. ), and the game is a touch overpriced. I really hope Dillon gets his own franchise, because the game and characters ooze classic Nintendo charm.